Historic Gill House This photo was taken in the afternoon of a pre-investigation walk around. We felt a presence in an upstairs window and snapped a photo with an iPhone. When returning home, we noticed what appears to be a woman, possibly a man and two children in the woman's skirt! 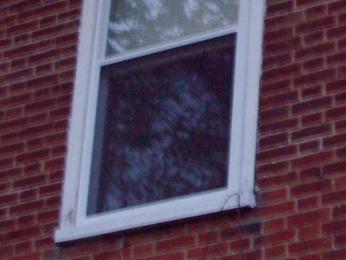 When the investigatiion took place at a later date, our Team learned this was a window in the "mother-in-law" apartment. 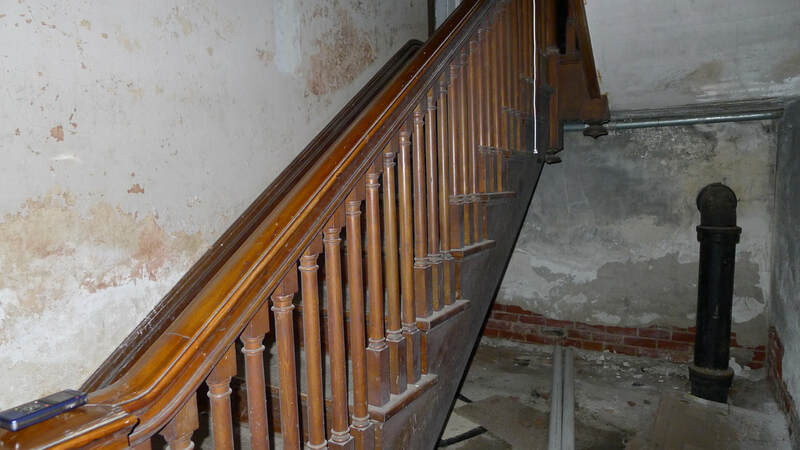 Every investigator noticed the extremely intense and heavy feeling in that area of the upstairs. 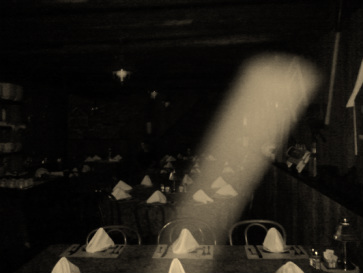 One of our best photos of an apparition! See more Gill House photos below, click for caption. Dowsing Rods crossing in a location of the home where an accident occurred, with three people injured and one eventually passing on. Dowsing Rods work much the same way as Mel Meters and other electronic equipment by reacting to subtle energy patterns. Our Mel Meter is showing a fairly high reading outside the location in a consistent manner, on the North East corner of the home. The readings were also high inside the house on the same corner. With the exception of a small TV, there was nothing inside or out to indicate a reason for the readings. The history of the home revealed an explosion had occurred 75 years prior, the result being the foundation crumbling on the North and East sides. A mist is seen in the middle of this picture. Is it the weather conditions or something more? Owner of this property has never seen weather related fog this high above the ravine behind the home. If you look closely, there appear to be faces. The "orbs" are snow. The building on this property is made of logs, though now covered with siding, and was a cider and grain mill at one time. 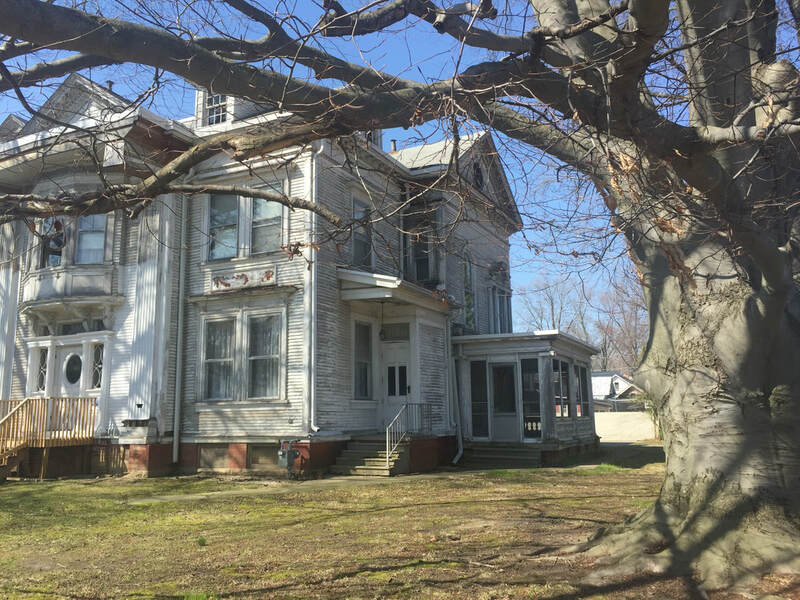 During the Flood of 1913, it was pulled by horses up from the river and eventually became a home. 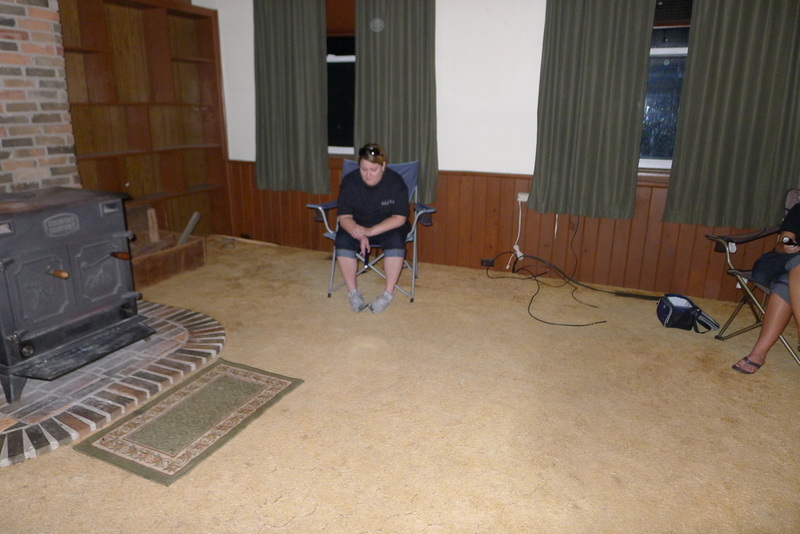 Sitting on the floor, we could sense the energy of rushing water still held in the old wide plank flooring! Strange sensations! 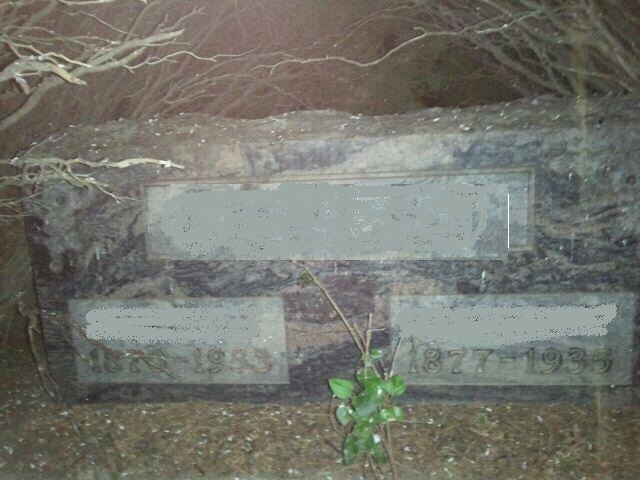 Private Residence Case 52215-Current owner of property has leaned the tombstones up as a sign of respect. Previously lying down covered by weeds. Four known burials in the plot, this being a wife/mother and one of two infants. What looks like the broken off bottom of a tombstone, which is near the tree where they are now leaning. 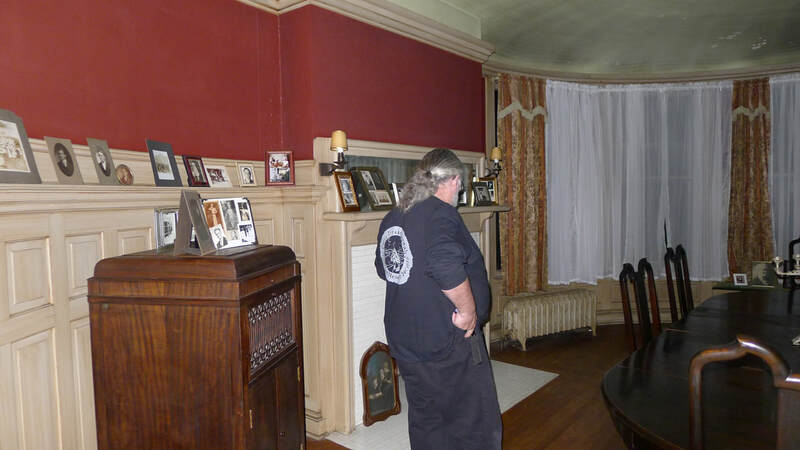 Private Residence Case 52215- An orb approaches a K-2 meter being held by an investigator. The orb touches the K-2 meter causing it to activate. Photos taken with infrared camera. 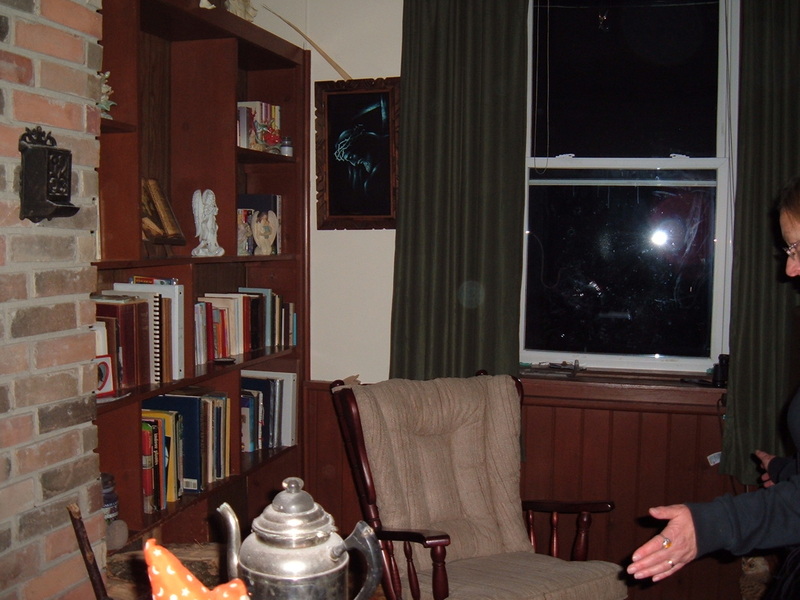 The photo on the left is a cropped image showing a light anomaly that was captured in front of the curtained window. Our Full Spectrum video camera is set up just below. 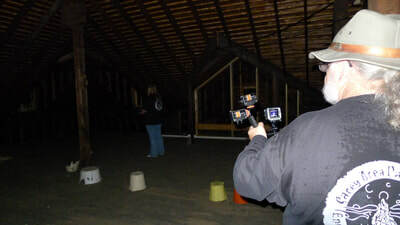 The camera audio captured a "humming" later in the investigation. One of our audio recorders also picked up a clear evp in this room during our initial walk through of the location. 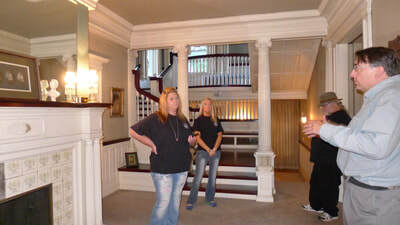 Could this be a disembodied spirit in motion? 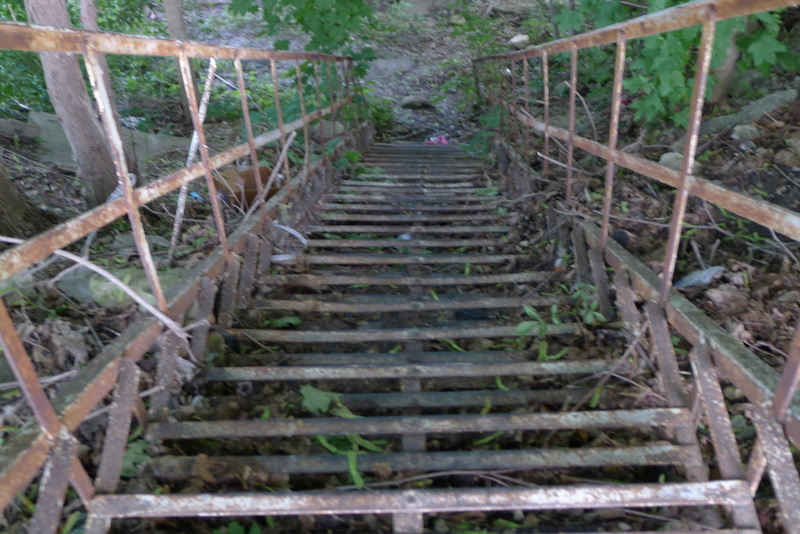 This old fire escape leads to the River that is adjacent to the location investigated. C.A.P.E.R.S. team members were drawn to this spot and sensed that the old steps were from a building that had burned. 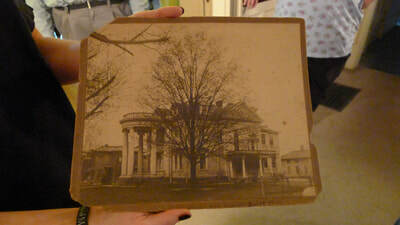 Research revealed that two buildings, several blocks away, had caught on fire in 1976. It was also felt that the home's close proximity to the River has contributed to the occurrences. 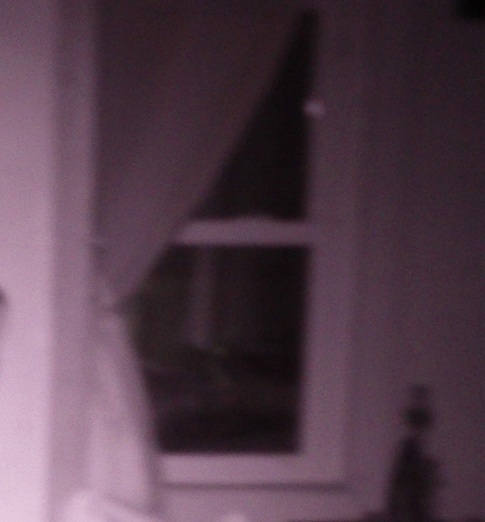 PRIVATE RESIDENCE CASE 31514-Small anomaly, top right, in an active bedroom. Shot with our Full Spectrum camera. CASE 103013-Our first time investigating a woods! We see a face in this blue orb! Photo cropped. CASE 103013-Team members saw this type of orb with the naked eye, on several occasions during the investigation! Interesting photo showing an orb in the tree and a face in both the upstairs and downstairs window. An excellent example of Pareidolia (human tendency to find meaningful patterns from randomness) whereby possible spirit energy uses "visual noise" to manifest. In this case the reflection of the tree in the windows. 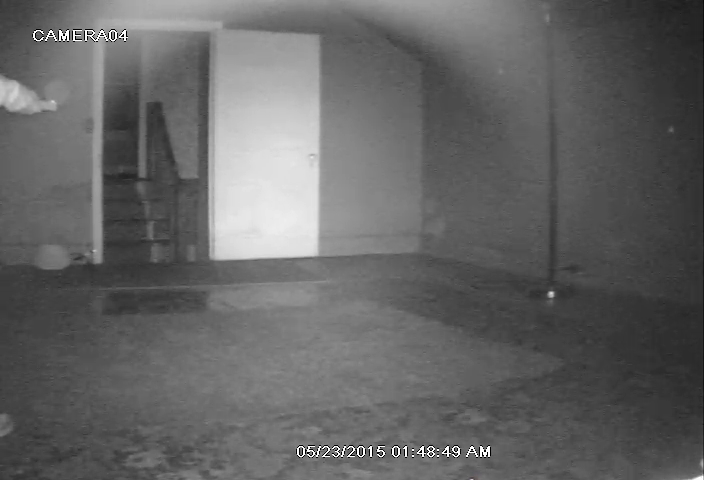 This photo contains what appears to be a moving anomaly, middle right side, in the crawlspace area of the basement. 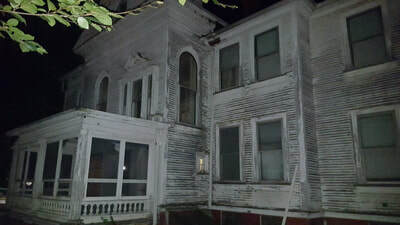 EVP's were also captured in the basement of this home. See our Video/EVPs page. PRIVATE RESIDENCE CASE 72013-This mason jar, used as a light bulb cover, broke and fell from a ceiling light minutes after we left the area during our initial walk through. We heard the crash and this is what we found. PRIVATE RESIDENCE CASE 72013-The ceiling light has been in use for approximately 5-6 months. The cover, missing from the higher left side bulb, did not come unscrewed from the lid but broke and fell. The light bulb remained intact. Faulty jar, heat build-up or paranormal occurance? 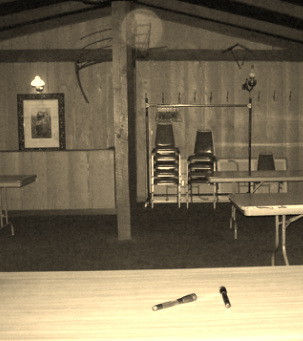 EVP's were captured in this former porch turned breakfast nook. Mirrors are thought by some to be portals into other realms and dimensions of existence. C.A.P.E.R.S. 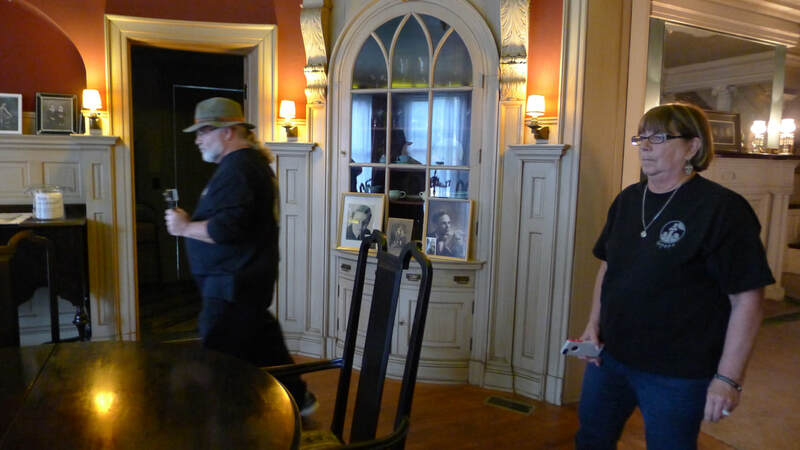 felt the mirror to be a doorway for the spirit activity found in this home, heightened by the location and reflecting the stairs. The bulk of the activity was in the upstairs hallway and one of the bedrooms, directly above this mirror. It was recommended to the owner that the mirror be removed. Orb on the curtain in an active corner. Click on photo to enlarge. 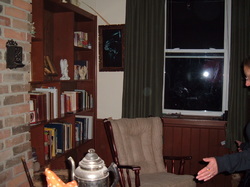 Same location a year later and another orb is captured on the curtain with a different camera. At the time this photo was snapped, a flashlight was blinking without having been adjusted to do so. Click on photo to enlarge. 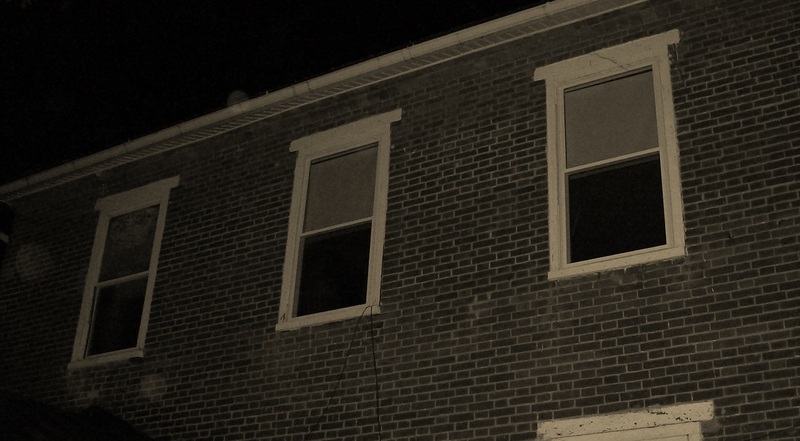 A face was captured in this bedroom window while two team members were investigating outside the home. A tapping sound was heard coming from the windows and the picture was snapped. It is an excellent example of Pareidolia which is the human tendency to find meaningful patterns and shapes out of randomness. 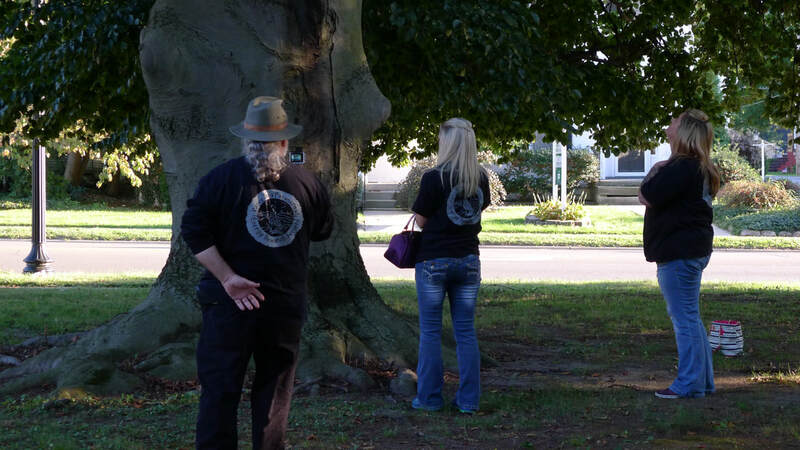 The theory is that spirits need "visual noise" in which to manifest images in the physical realm, in this case the reflection of the tree in the window. Later into the investigation, another face is captured! (far left, top half) Click on the photo to enlarge. 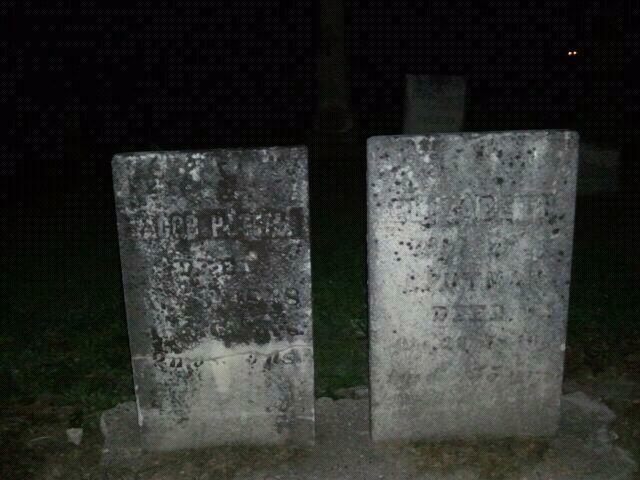 Tombstones were found which had been moved from their original location. 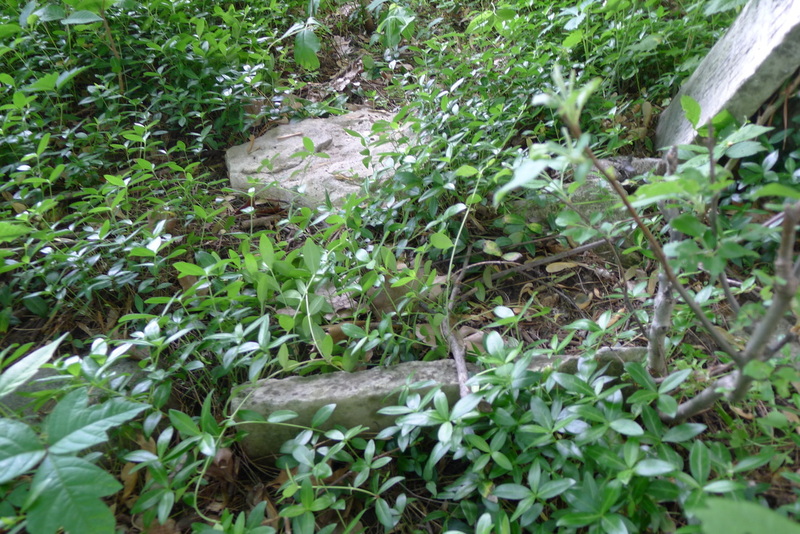 The old, unmarked cemetery is located on the property. Our team concluded that this is one of the possible causes of the classic haunting! Unusual picture taken in an active location. Possibly a shaft orb? 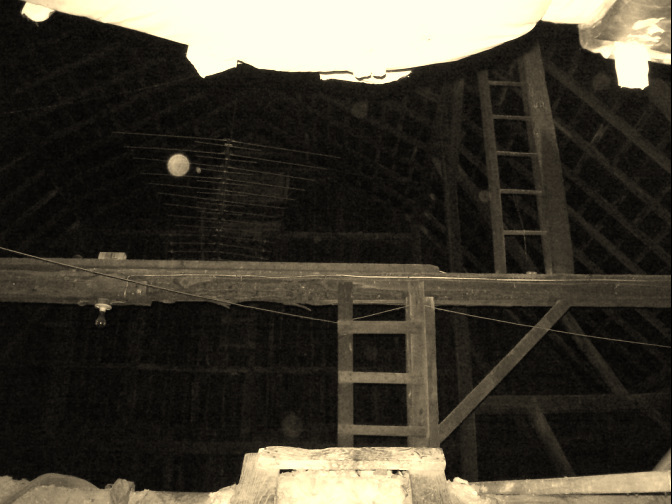 One very bright orb and six fainter ones in the rafter area. Interestingly enough, one team member's walkie-talkie began receiving an unidentified transmission, saying the investigator's name, about the time this photo was taken. Note the brightest orb is on the antenna. Also at the time of the walkie talkie incident, and in the same area, flashlights on the table began to roll of their own accord..rolling one way, stopping, then rolling back the opposite way. 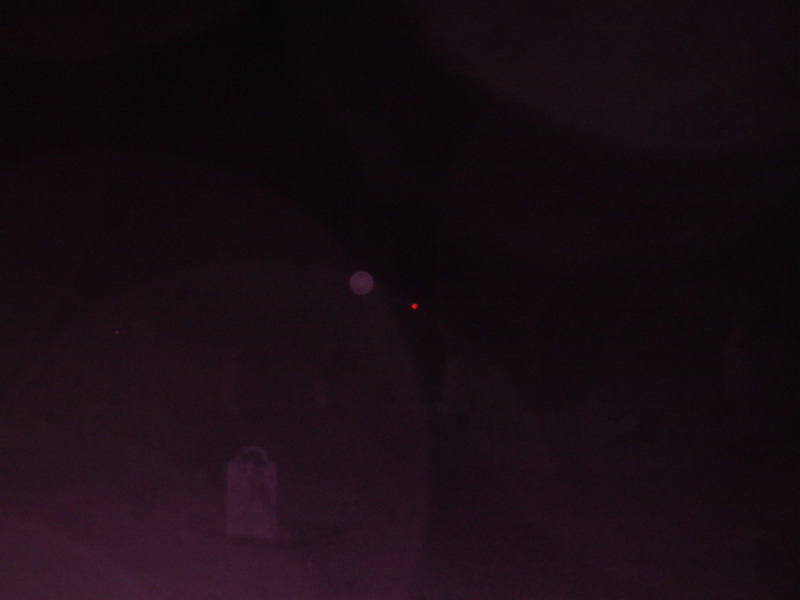 Note the large orb at the top of the photo. Once again, multiple phenomena. Very strange! The three photos below were snapped in succession, within seconds of one another. The photo on the left shows a light anomaly on the bottom left hand side. It appears that the anomaly has moved to the center in the second photo and moved away in the third. The weather conditions were mild and dry. Click on the photos to enlarge. 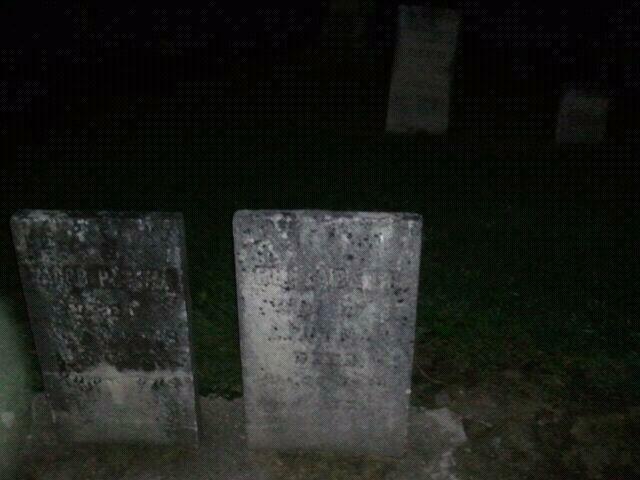 Three orb photos shown below. 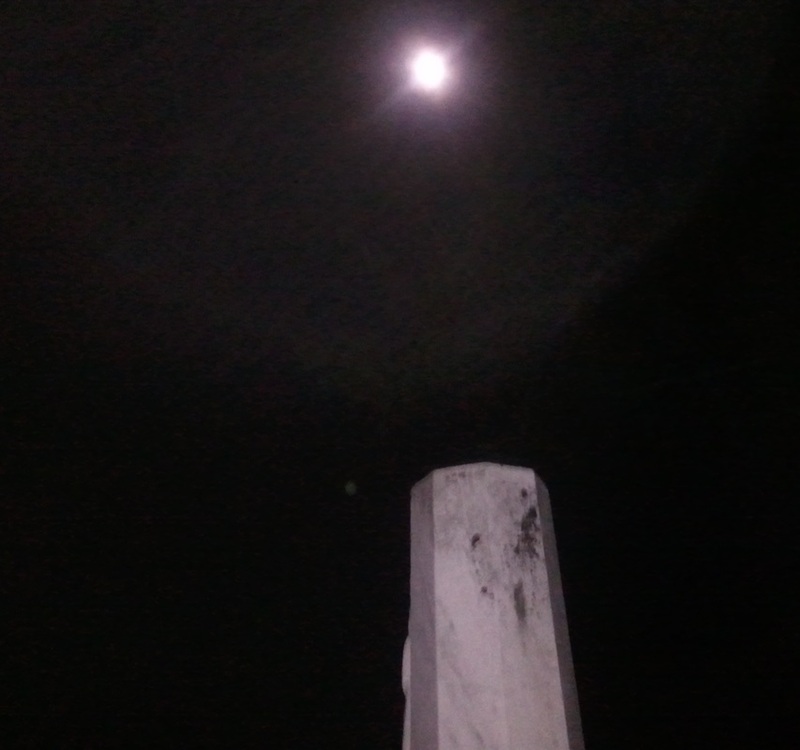 Picture on the left contains a very small orb, which could be a reflection of the Full Moon. 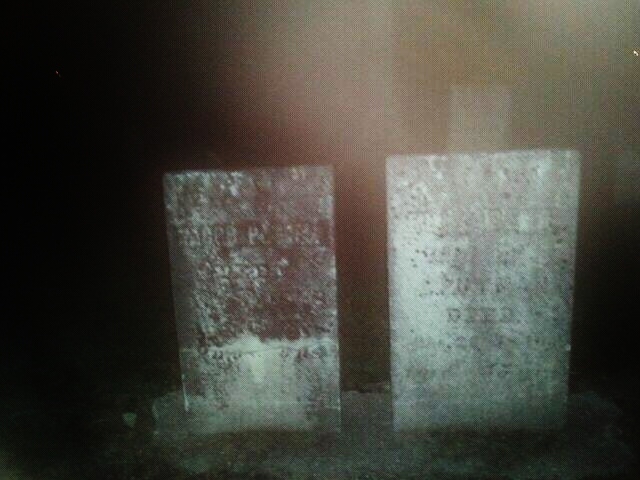 The orb in the second photo would seem to be the most likely of the three to be of spirit origin. 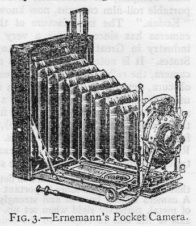 The third photo is shared as an example of a light reflection from the security light in the background, in our opinion. Click on the photos to enlarge. This burial plot is connected with a local legend. 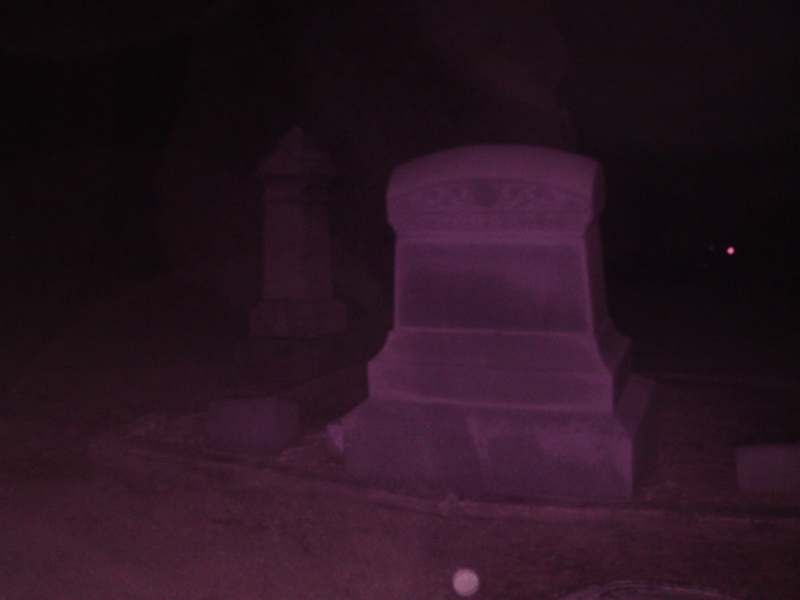 A woman's face, with hands around her neck, was said to have appeared on the original tombstone. The story told of the wife having been strangled. After vandalism at the cemetery, due to the crowds that came to view the headstone, it was removed and a small marker placed on the grave. At some point in time, this tombstone was erected. The C.A.P.E.R.S. team sees three faces. One in the upper right, in the upper left and positioned as though lying on it's side between the names. What do you see? Click to enlarge.